IT WAS A sullen-faced Les Kiss that addressed the media in Galway on Saturday. His side had just been walloped 44-16 by Connacht, conceded six tries and were already facing more questions from incensed supporters who were baying for blood to be spilled in the form of Kiss’ job. Beside him, double centurion Darren Cave had a stare that penetrated the wall of the media centre at the Sportsground and seemed to gaze a thousand yards into the distance. In five words, Ulster’s Director of Rugby summed up the dismal performance in terms of his coaching career. 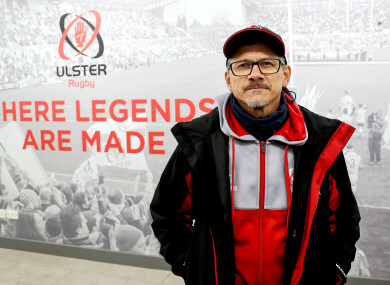 Five days on, and back in the more familiar surroundings of Kingspan Stadium in Belfast, the Aussie has had time to reflect on the defeat and where it went wrong. Or, possibly more realistically, if they actually got anything right. “It’s not changed much to tell you the truth,” Kiss sighs. “It was disappointing on a number of levels from everyone’s perspective. “We spoke about it yesterday, the team got together afterwards. It wasn’t just the 15 or 23 that are hurting from it, the squad are, you could tell, everyone was concerned that that was not what we are about. The problem is that wasn’t an anomalous performance. While results haven’t been glaringly poor, the on-pitch product has been horrendously under-par and has earned the wrath of a frustrated fanbase. When you consider that this Ulster side are on track to not just concede the most tries in a single campaign, but to eclipse it by some margin, it asks questions of a coach who is a supposed defensive expert. Instead they have shipped 45 tries in 15 games – including six on two occasions against La Rochelle and Connacht – and are, more worryingly, slipping down towards Edinburgh in fourth in Conference B of the Guinness PRO14 rather than keeping pace with the Scarlets and Leinster. While the latter pair have established themselves amongst the league’s top bracket of sides, alongside Glasgow and Munster in Conference A, Ulster are slowly slipping away from where they want to be. Injuries have played their part, Marcell Coetzee and Jared Payne’s long-term issues massive losses, but in truth the excuses are running out – Kiss looks to be on borrowed time. “I’ll be honest, I haven’t read one thing on social media, but that noise is out there. It’s been out there for a while and I understand it,” Kiss says of the increasing scrutiny on his position. “We always feel pressure. It’s not something you escape. It’s something like a weird nature in us as beasts, something you revel in as well, you want to be able to stand up to and feel and fight against. “But ultimately it isn’t about me. It is about the team and my job along with the coaches is to get it together and crystalise what this means to us this week and do the job on Monday. That’s been my focus. Respond they must, lest they fall further behind and potentially out of the PRO14 play-off spots. However, Munster are the visitors to Kingspan Stadium on New Year’s Day (kick-off 5:35pm) and, even though they will send a diluted side north, it won’t be a walkover. It’s a fixture that Ulster recently haven’t had the best results in. In fact, they haven’t tasted success against their interprovincial rivals since May 2014 when a shadow side produced a stunning performance to win in Limerick. It goes without saying that you have to win your home games, especially during the festive period when the big fixtures come at you thick and fast, so there’s nowhere to hide if things go wrong on Monday. With a trip to Leinster still to come, a match-up that Ulster have historically been firmly on the wrong side of, and the final two European games against La Rochelle and Wasps on the horizon too, it only makes getting four points this weekend even more crucial. This week excuses won’t fly, only a win will do and, arguably, it has to be accompanied by a performance that is effectively the polar opposite of last Saturday’s capitulation out west. “We have a week to make sure that we deal with that properly and Monday is the opportunity we have for that,” Kiss states. “But that is Munster’s opportunity as well, they were well beaten by Leinster in fairness, but they are going to come here wanting to atone for that as well. They are a difficult team to beat the best times and we have not had the best against them in recent years. No more wiggle room. No more get out of jail cards. Ulster and Les Kiss need to produce – now. Email “'We are cut, we are hurting but we've got to make sure we do whatever is necessary to return this week'”. Feedback on “'We are cut, we are hurting but we've got to make sure we do whatever is necessary to return this week'”.